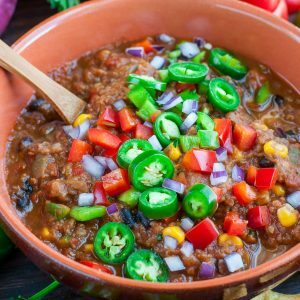 This deliciously easy vegan lentil chili is sure to impress! With stove-top, pressure cooker, and slow cooker versions all in this post, you can whip it up any way you choose with minimal effort. all the tasty toppings your heart desires! Below are the electric pressure cooker instructions. For stove top or slow cooker instructions, see blog post below. Switch your pressure cooker to the saute funtion and saute 1 TBSP oil with onion for 3-5 minutes, until edges are golden and browned. Then add garlic, peppers, and corn, and cook for an additional 3-5 minutes to soften slightly. Add lentils, veggie broth, chili beans, black beans and spices. Set to high pressure for 15 minutes and allow to come to pressure. Allow a natural pressure release. Lastly, stir in crushed tomatoes and adjust broth/tomato/seasoning to taste, adding more of what you prefer to get your ideal thickness and flavor punch. I added the crushed tomatoes at the end to avoid overstuffing my pressure cooker and score a quicker cook time as well. Since my crushed tomatoes were canned (LOVE muir glen's organic tomato basil) they took zero time to heat up once swirled into my piping hot pot-o-chili. Sweet! If you want to dive in sooner, feel free to manually release the pressure on your Instant Pot by flipping the little lever from seal to vent. Worst case scenario, if your chili needs a little extra time you can seal it back up and give the veggies extra time to soften. Pressure cookers are pretty forgiving like that! Add all your favorite toppings and dive in! Feel free to adjust the consistency of the chili to your liking. As written it's perfectly thick and full of delicious texture, but can be thinned with a little broth or tomato sauce if desired! If you add a lot of extra liquid, consider amping up the spices a smidge to compensate. You can also make this as mild or as spicy as you'd like. As written it is pretty mild, then the jalapeños I added on top of one bowl really amped up the heat! Pressure cooker recipes always leave out the details so here's a breakdown of what you can expect time-wise: About 13 minutes to come to pressure plus 15 minutes cook time and 15 or so to release pressure. You won't need to be anywhere near your kitchen for this all to partake, the Instant Pot will handle it all and switch to warm once it's done. So fabulous right? Nutrition facts below are an estimate provided by an online nutrition calculator. Add your favorite toppings and adjust as needed.